Join our team of volunteers, who play a vital role in helping Palisades provide world-class care to our patients and their families. Each and every gift advances our work today and our vision for tomorrow. Stay up to date on all of our latest news, photos and community activities. 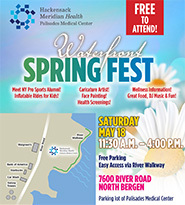 FREE Waterfront Spring Festival from 11:30am-4:00pm on Saturday, May 18 at Palisades Medical Center! Join us for fun activities, great food, DJ music, wellness information, health screenings and more. Pre-register to enter our raffle!